This is the second of a two part-review of the book written by Mark Noll and Carolyn Nystrom and published by Baker Academic. Although the book was published nearly six years ago, the issues involved are extremely pertinent to today. In this second article, we will seek to point out what are believed to be the two main weaknesses of the book. As stated before, it is a well-written and extremely informative review of the relationship between Catholic and Protestants. Our two main contentions or criticisms of the book deal with the subjects of history and theology. In the area of history, the writers fail to state clearly two important and pertinent facts. The first omission deals with the development of the Roman Catholic Church as an institution while the second omission is the failure to answer the question as to why there was a reformation in the first place. Throughout the book the writers encourage the reader who desires more information regarding the Roman Catholic Church and where it stands on doctrinal issues to purchase a copy of the Catholic Catechism and read it carefully. Frequently the authors state that an Evangelical will find much in the Catechism with which he can agree. In one paragraph, Mark Noll stated that while reading the Catechism, he was led to put it down and worship in prayer and thanksgiving because there was so much with which he agreed. Note page 116 where Mr. Noll states this. No one who has an understanding of Church History would necessarily dispute that statement. However, a study of Church History reveals a pattern of the Roman Church in deviating from the faith over a period of time. Much of what the Church Fathers wrote would be accepted as orthodox today. For example, one would be in agreement with the Nicene Creed and its statements about the deity of the Lord Jesus Christ. Many Protestants Churches recite the Nicene Creed as part of their liturgy. One also would agree with Augustine in his controversy with Pelagius regarding the sinful nature of man. However, the further one proceeds on the path of Church history the more he encounters certain doctrines that transformed the Roman Church into a sacramental church. For example, following nearly two hundred years of controversy regarding the nature of the Eucharist, the IV Lateran Council of 1215, under the direction of Pope Innocent III, formally adopted the doctrine of transubstantiation. In the reviewer’s opinion, this was the time when the Roman Church officially became the Roman Catholic Church. No Biblical evidence for the doctrine of transubstantiation was produced by the Council. However, transubstantiation was now an official doctrine of the Church and one was required to believe it or be condemned as a heretic. The authors of the book are silent when it comes to this divergence of the Roman Catholic Church from the Biblical norm. They appear to be of the opinion that if we can agree with some of the doctrines of the church we should be able to agree with all of its teachings. A second major historical flaw is the failure to address the question as to why there was a Reformation in the first place. Before one asks the question is the Reformation over, they should query why there was a Reformation in the first place. Throughout the course of the Medieval Period, there were repeated calls for a reform of the church. There were differences of opinion as to who was to undertake the work of reformation and whether it was to be a reform of morals or a reform of both doctrine and morals, but a broad consensus existed on the necessity of reform. Even before Martin Luther there were those who called for a thorough doctrinal reform of the church. No one truly believes that Martin Luther deliberately set out to reform the Church. However, he was convinced by personal experience that the Church was not teaching the Biblical doctrine of salvation. Martin Luther was not interested as much in the reformation of the Church as he was in the salvation of his own soul. He did everything that the church commanded him to do and yet he never experienced the true forgiveness of sins. He is reportedly to have said if ever there were a monk who through his own efforts could merit heaven, he was that monk. But all of his efforts to gain salvation through what the Church taught did not bring him a clear conscience before God. However, Luther came to understand that salvation is by faith alone and not by the partaking of the sacraments as the church taught. When reading his life one concludes that he was borne along more by events than a concerted plan of reform. We have now come to a time when many are asking whether the Reformation was a “tragic mistake.” No one would agree that everything that was said or done in the name of reform was perfect. There were tragic mistakes and blunders. However, such an attitude fails to answer the question as to why so many persons were willing to risk their lives and fortunes to accomplish something that was not needed. Why were people willing to go the stake and suffer so greatly? It certainly must have been for strong convictions. Although there have been and always will be those who have a martyr/s complex, it beggars the imagination to think that all those who suffered did so for so slight a motive. These are the types of questions or reflections that seem to be strangely lacking in a book that purports to provide an answer to a question of such magnitude. However, there is another failure of the book and that is to deal with the theological issues involved. 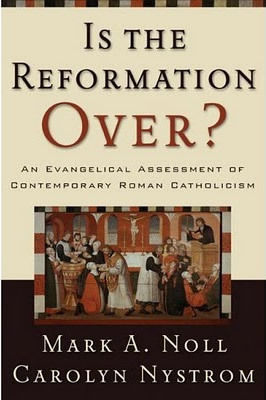 The Reformation was the time of recovery of the doctrine of justification by faith alone. While it is true that the Roman Catholic Church teaches a doctrine of justification, there are two crucial areas in which it differs from the Protestant. The places of disagreement are in what are called the formal and instrumental causes of justification. The formal cause is that which gives to something its quality while the instrumental cause is the means whereby the result is accomplished. The instrumental means of justification according to the teaching of the Roman Catholic Church is baptism and the formal cause is the infusion of God’s righteousness. The result of baptism is that the person is forgiven of original sin and is regenerated or born again. Then he is required to cooperate with this infused righteousness to live a godly life. When he reaches a certain level of sanctity, he is then accepted by God as righteous because he is indeed righteous. In contrast, the Protestant position regarding justification is that the instrumental cause is faith alone and the formal cause is the imputation of the righteousness of Christ to the person. God then pronounces the person to be justified solely on the basis of Christ’s righteousness imputed. It is for the above reason that many believe the Roman Catholic Church confuses the doctrine of justification with the doctrine of sanctification. Protestants believe in an infused righteousness for sanctification or growth in holiness but hold exclusively to an imputed righteousness for justification. It is the repeated failure of the book to deal with these issues that vitiate its effectiveness. While it is true there is much that a Protestant could agree with Catholics about, there can be no agreement regarding the crucial issue of justification. It is simply impossible to reconcile an imputed righteousness with an infused righteousness for justification. Despite the claim of the ECT statement The Gift of Salvation that agreement has been reached regarding the doctrine of justification, this reviewer must register his dissent. What can be done to resolve this impasse? The critical question is not so much as to whether the Reformation is over but have the doctrinal truths especially regarding the doctrine of justification by faith alone entered my heart and soul? Am I truly a Christian according to the teaching of God’s Word? At the end of the day it matters little whether I agree or disagree with the authors of the book on their question but it does matter for eternity whether or not my sins are forgiven and I have experienced Biblical salvation. Thus the conclusion of this review is not to express an opinion but to encourage people to search the Word of God to be absolutely certain that they are truly saved. The five solas of Christ alone, grace alone, Scripture alone, faith alone, and God’s glory alone are not merely a party slogan but the express teachings of the Word of God on the subject of salvation.